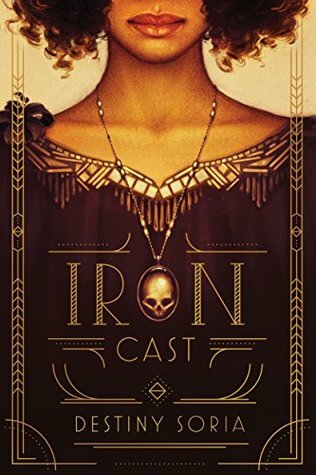 I received an Advanced Reader’s Copy of Iron Cast from the publisher via Netgalley in association with The Fantastic Flying Book Club in exchange for an honest review. Iron Cast defies all the preconceived notions of young adult novels and finds itself in a class of its own. It’s a gritty crime story filled with corrupt politicians, criminal masterminds, and most importantly, magic! Iron Cast could definitely hold its own among the best gangster stories out there. There was a pleasantly surprising amount of action, suspense, twists, and turns in this story, keeping this story moving along at a fast-paced speed. In between all the action, Iron Cast still delivers exceptional and diverse characters and world-building. Ada and Corrine were distinct, and while sometimes frustrating, likeable characters that you couldn’t help but root for. Corrine was strong, abrasive, and determined, charging ahead full speed at all times, while Ada was quiet, thoughtful, and more meticulous, following Corrine into battle and continuously saving her friend from her own demise. There were muted love stories still emotional and impactful, without interrupting the flow or taking center stage. Most importantly, I loved how Ada and Corrine navigated their afflictions and their secret lives with their families, particularly their mothers. There’s not a single recurring character who lacked personality. Even poor Gordon and his cat leave a lasting impression. The word-building was very well done as far as describing places–how they look and the emotions they evoked. It’s most apparent when the girls are using their magic to create illusions. It’s easy to imagine you’re being transported along with the characters, from a shanty basement to standing on the precipice of a cliff during a raging storm. The descriptions are flowery and vivid. If I had one complaint, it’s that the story lags a bit in the middle. After the initial conflict is introduced–when Johnny Dervish goes missing–the story strays for a bit before returning to the characters trying to develop a resolution (which includes Corrine doing her best young Fred Jones impression and insisting that Johnny’s long-time rival Luke Carson is their Red Herring). Overall, this was a great read that I would definitely recommend if you’re looking for something different from the typical sci-fi, fantasy, and contemporary stories that dominate the young adult blogosphere. Oh, I like the sound of this!